Saab launches its second-generation Saab 9-5 this year, 13 years after the first model debuted. The mid-sized premium sedan shares its platform with the Opel/Vauxhall Insignia, which was the 2009 European Car of the Year. 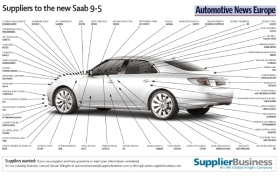 Opel/Vauxhall and Saab were sister brands under General Motors Co., which sold Saab to Spyker Cars NV late last month. The new 9-5 is key to the Swedish automaker's plans to recover from nearly being closed by GM earlier this year following years of financial losses. The new 9-5 comes with a choice of four engine variants: three gasoline and one turbodiesel. A company that plays a big part in keeping those engines secure is ContiTech AG's Vibration Control division. The business unit supplies the 9-5's plastic power unit mounts, which are used on the engine, transmission and other parts. The mounts dampen vibration and prevent the powertrain from coming into direct contact with the automobile's body. The fasteners need to be very secure to prevent powertrain detachment, which is a possibility during a collision. Such high-strength requirements normally require the power unit mounts to be made from steel or aluminum. However, ContiTech's fiberglass-reinforced polyamide mounts meet those strength requirements while also reducing weight, which leads to better fuel economy and a reduction in CO2 output. In addition, less heat energy is required to mold plastic than aluminum, further underling the product's environmental credentials. The mounts are made at ContiTech's factory in Hanover, Germany. Haldex AB supplies the automobile's all-wheel-drive system. American Axle & Manufacturing Inc. provides the 9-5’s rear-drive module, which it makes at its plant in Silao, Mexico. German supplier Hella KGaA Hueck & Co. produces the vehicle's bi-xenon front headlamps while U.S.-based Visteon Corp. provides the rear lighting system, which includes the rear lamps, LED brake lights, two-diode backup lights, bumper-mounted fog lights, rear-side lights and the bulbs to illuminate the license plate. The Saab 9-5's rear lamps and LEDs are developed and manufactured by the company's Visteon-Autopal unit in Novy Jicin, while the fog lamps are assembled in Rychv, both in the Czech Republic. Saab builds the 9-5 at its plant in Trollhattan, Sweden.